Good afternoon everyone. It’s Liza, the Owner of The Wandering Path. 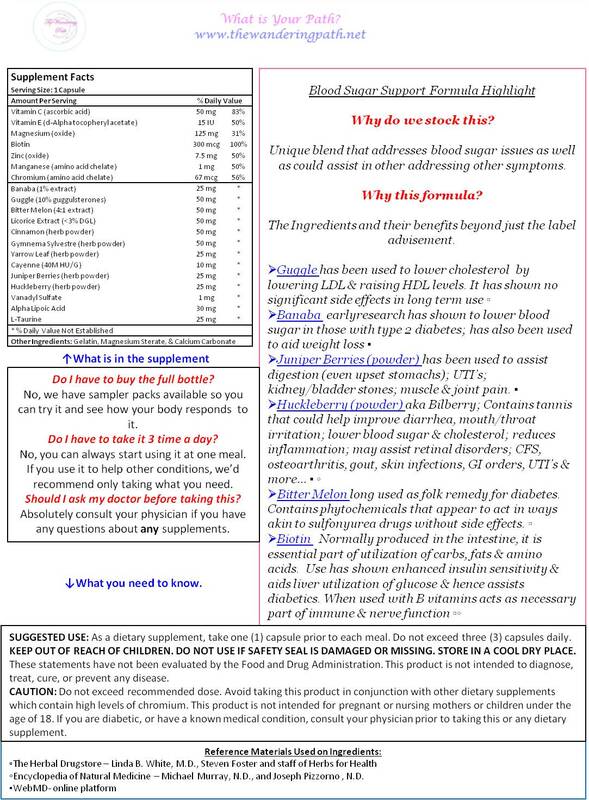 I have had a busy morning but happy to say that I squeezed in time to complete the “why” sheet for the Blood Sugar Support Formula I chose. If you’ve been following us on Twitter or Facebook; you’ve seen me report that I started to take this due to repetitive days of severe muscle pain & joint swelling. I was happy to find that some of the ingredients in this formula addressed that, hence the “guinea pig” trial. Over the years, I have done this often trying to find treatments for my various conditions…as I believe nature can provide things to assist without as many side effects. Western & Eastern (Alternative) medicine all need to work together; if there is a more natural way to treat what is ‘wrong’ vice just a symptom then that is the path I’d rather travel. I spent too many years on Western meds that the side effects were worse than the symptoms (I gave it up as a primary after my teeth disintegrated…literally, because I didn’t realize the pain meds I was on were draining the calcium; I don’t even want to fathom what it did to my bones). We all have problems eating right and probably need help lowering cholesterol, blood sugar levels; improving kidney/liver function; dealing with digestion issues, UTI’s etc… and so I tried to highlight some of the ingredients you may have never heard of. Please, be well…achieve wellness…it leads to a much fuller life experience.